As a society we tend to spend the majority of our time sitting down whether it be at home, at work or even on our daily commute. You may spend your sitting time behind a desk all day, watching TV at home with the family, checking your facebook updates, playing the latest Tomb Raider or even in a car or plane for hours on end. A recent survey estimates that the average American sits for 13 hours a day. One of the biggest causes of back pain, especially lower back pain is your sitting position. When we sit, we place our body weight and more pressure on the lower spine. Using the best back seat cushion for lower pain can help support posture, prevent too much pressure on your back and help relieve that incessant pain. It may start off with telltale indentations in your clothing but over time that ache will spread from your coccyx at the bottom of your spine and eventually result in back pain and maybe even spinal cord issues that could require a visit to a specialist and in some cases need surgery to fix. Seat cushions can be an ideal way to help with comfort and aim to reduce pressure on your coccyx and save you from that back pain. Decreases pressure on the back up to 35%. Adjustable and removable lumbar support, depending on need. Built in handle for portability. The cover is removable & machine washable. Made with 100% pure memory foam. With a 3” height, this cushion is great for supporting the back while driving. Also works as a pregnancy cushion. Memory foam covered with a soothing gel layer provides both support and comfort. Designed to relieve sciatica. A U-shaped designed enables the coccyx to “float,” preventing compression and alleviating pain. Never becomes flat. Do You Need a Seat Cushion for Lower Back Pain? Back pain is the second biggest cause of disability in the US with over 149 million work days lost each year due to lower back pain. As a society we’ve become more sedentary, with even our journeys to work forcing us to sit for an hour or more each day. Most occupations now involve seated activity at a desk in front of a computer and, in fact, the earlier cited survey also reported that 86 percent of occupations in the US involve sitting desk work. Products that can help back pain are balance balls, which improve your posture, back braces that can support your muscles or ice pack application to numb the pain. Muscle creams like Deep Heat will also help relieve back pain—but they can be a bit odorous—or a massage from a professional therapist will help ease the discomfort. A more effective way to get rid of lower back pain is choosing a supportive yet comfortable seat cushion. Most cushions are quite lightweight and portable and can be easily transported from your home to the car, from the car to the office and even for use on a tiring plane or train journey. A recent study found that a seat cushion with a cutout, designed for back support, significantly increased the comfort of patients with lower back pain. Perhaps the first thing to consider is the shape of the cushion. Seat cushions or pillows come in many different shapes and sizes specifically designed to target certain areas of the back. Some are available as a full seat with backrest and others are merely a cushion that you sit on, often with a U-shape design to allow your tailbone to ‘float’, thus relieving pressure and pain on the coccyx. No matter what shape the cushion is, it should mold to the contours of your body to strengthen the muscles, provide support and promote correct spinal alignment. The material of the cushion can be another important consideration. Most seat cushions for back pain are now made from memory foam which adapts to your body while molding to the buttocks. The firmness is sometimes difficult to adjust and these cushions can flatten with time. Inflatable rubber is used in a small number of seat cushions for back pain which are easily adjustable by letting air in or out according to the user’s preference. Most cushions come with a soft fabric cover. You should try to ensure the cover is machine washable as you’ll probably be sitting on it a lot. Breathability of the fabric is also important as temperature can often add to the pressure when you’re sitting for longer periods of time. Some cushions now feature either mesh covers or a cooling gel insert which aims to regulate the temperature of both the cushion and the person sitting on it. With so many different products available how can you be sure you’re buying the one best suited to your back pain and your environment? We’ve looked at many of the top selling seat cushions and supports to bring you, in our opinion, five of the best seat cushions for lower back pain. Now…are you sitting comfortably? This is the largest of the seat cushions we looked at which combines a backrest and seat cushion but has been scientifically proven to reduce pressure on the lower back by up to 35 percent. The seat cushion or backrest can be used independently or together with adaptation for different seating environments. 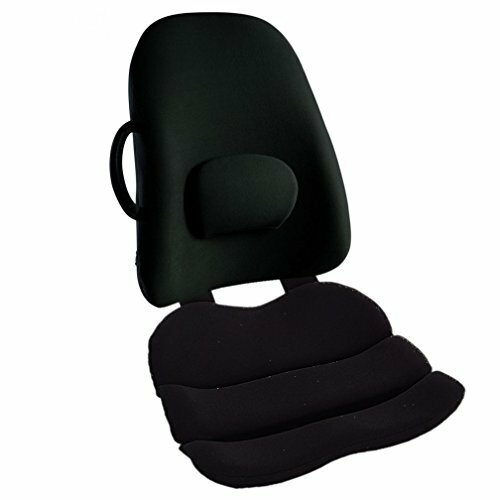 You can just as easily use this in the car as you can the office and removable lumbar pad offers extra support if needed. 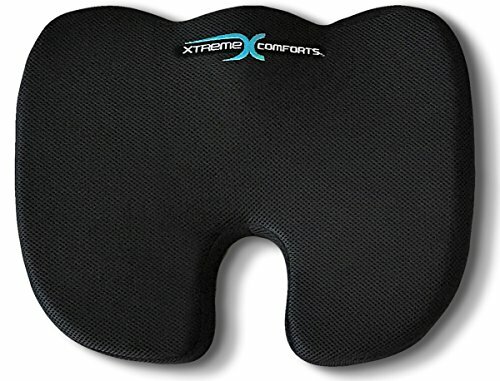 This product is ideal for prolonged periods of sitting with a design that distributes body weight more evenly, effective for helping with pressure sores. As well as being removeable, the lumbar pad is also adjustable. Two hook and loop fastenings attach the back rest to the cushion with a removable zippered front part of the seat for use on narrow chairs or benches. 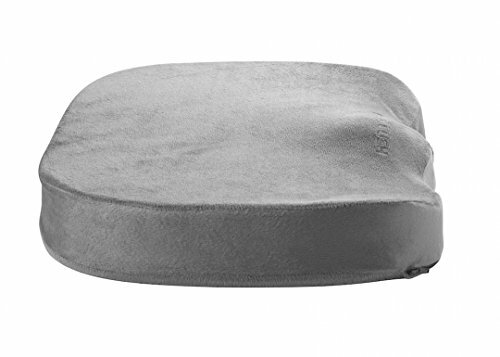 A brushed nylon cover provides a softer surface and can be removed to be sponge washed. Combination design eases pressure on back by 35 percent. Adaptable for almost any chair or sitting surface—even suitable for car use. preventing pressure in coccyx or back. Shape of backrest is found uncomfortable by some users. Some people complained it made them sit almost hunched. 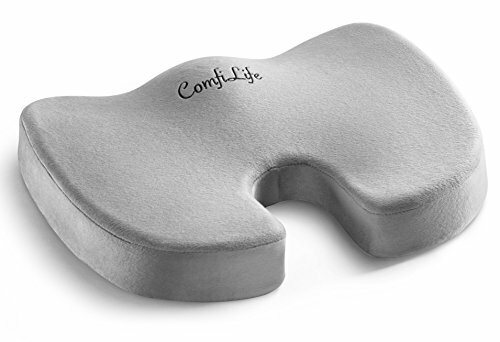 This memory foam seat cushion from ComfiLife provides relief from back and sciatic pain. An ergonomic design provides full support without any compromises in comfort. The U-shaped contour promotes a healthy correct posture with raised edges that prevent you from slipping off. A high density memory foam adjusts to your particular body shape and conforms to the buttocks for greater comfort. A rubber bottom surface that isn’t slippery means it won’t slide about on your chair with a built-in handle making it easy to transport from one place to another, even from the office to the car. A machine washable cover can be removed for easy care. U-shaped cutout reduces pressure on coccyx. Non-slip rubber bottom ensures stability. High-quality memory foam contours to your body. Easy to care for with removable cover. Built in handle makes it easy to travel with. or be taken into stadium for sporting events. Quite a thick cushion which may require seat adjustment especially if used under a desk. may feel softer in warmer environments. therefore not suitable for larger users. Tends to flatten out with time. This orthopedic seat cushion was especially designed in a research lab using five different molds for the purpose of relieving lower back pain. Made from 100 percent memory foam, it’s 3 inches thick and often used in cars to raise a driver’s height. Although soft and comfortable, it won’t flatten like memory foam cushion as the foam was originally designed to withstand g-force during lift off. This cushion is ideal for use on an office chair, helping to keep your back in an upright position and is also a wheelchair friendly medical aid giving pelvic and hip pain relief. The memory foam helps to distribute your weight more evenly and relieves the stress when you release from the cushion, this cushion will stay 3 inches thick. A soft velour cover is easily removable for machine washing. 3 inches thick even when being used. springs back to position when not being used. Doesn’t flatten like many other memory foams. wheelchair or car seat cushion—could be used to lift height of shorter drivers. Suitable for use to relieve the back pain experienced during pregnancy. Large cushion and heavier than many others—not as portable as competitors. Manufacturer states its only suitable for use by people under 250 pounds. often goes as solid as brick. Can seem too firm for some customers. 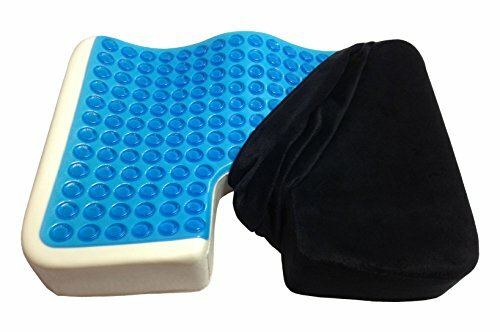 This orthopedic seat cushion uses a high-quality cooling gel insert along with memory foam to regulate the temperature of the cushion as it molds to the contours of your body. Ideal for long, hot summer days in the office, a lengthy car journey or those drawn-out football games at the stadium. A bottom that isn’t slippery ensures the cushion won’t slip from whatever surface you use it on, even a wooden bench. The U-shaped design relieves tailbone pain while also promoting better posture and a more even distribution of your weight. The memory foam conforms to your buttocks and doesn’t lose its shape with use, and the reduction of trapped heat in the cushion thanks to the cooling gel also relieves any potential pressure points. lower back and your buttocks/thighs. Larger design with more gel coverage than similar cushions. Memory foam molds to contours of body. Can become limp after prolonged use. Too small for larger users—people over 190 pounds find this cushion doesn’t offer the comfort they expected. Too thick to be used in car. This U-shaped pillow for lower back pain relieves pressure on the tailbone while promoting a better posture when seated for longer durations. Using memory foam it ensures an even weight distribution which molds to your body while offering ample support to ensure correct spine alignment. The memory foam is enclosed in a durable black mesh that provides superior air circulation to prevent sweating and keep you cool. The cover’s also removable and machine washable, simply unzip the zipper and cold wash before tossing in the dryer. A non-skid bottom aims to keep the cushion in place on slippery surfaces. U-shaped design is comfortable to use and provides relief from coccyx pain. Promotes correct posture and even weight distribution. Breathable mesh cover which can be removed and washed—helps keep you cooler as you sit. Cushion firmness can’t be adjusted—too firm for many users. Grips on bottom of cushion are weak and it may slide off chair. Memory foam tends to flatten out very quickly. Lower back pain is no laughing matter, in fact it can make you cry. You’re not alone and you may have noticed more people who now have lumbar supports or seat cushions for back pain in the office or the car. The best seat cushion for lower back pain will help relieve the pain of sitting down for extended periods, promote correct posture and hopefully make it easier to get out of your chair and move around more at the end of a long day. Although any one of the seat cushions we’ve looked at will help get rid of your lower back pain, the full coverage and adaptability of the Combo Orthopedic Backrest and Contoured Cushion by ObusCombo make it, in our opinion, the preferred choice for best seat cushion for lower back pain. It may be more expensive than the others in our top five, but this product offers versatility and a pain free day of sitting that you simply can’t put a price on.